This week marks another first for Julian. For the first time he can finally attend science camp with his brother. This is the third year that Sebastian has attended, so for 2 years Julian could only hear about all the amazing discoveries his brother was making. Julian has been excited for weeks, okay months, as he and Sebastian talked about science camp. He sailed happily into the classroom without a backward glance, just a huge expectant smile for what was to come. Every day when I go to pick them up Julian's smile appears before he does. When I imagined this week I had all sorts of plans of what I would do with my time. Many of my ideas were centered in the kitchen and this blog. Turns out I don't have all the free time I was dreaming of. Instead I worked my final shift at one job and I have spent more time learning about my next position, one I will share more about later. I also did not imagine myself needing to sand my deck and teak table as a result of my little scientists! After camp on Monday I was in my kitchen when Julian came in, climbed on the counter and tried to head out with a box of food coloring. I calmly removed his loot and sent him on his way, patting myself on the back for avoiding whatever catastrophe was brewing. I should have been tipped off when Julian just went away without a battle. Julian has never been a child who gives up easily. When he was a toddler you could distract him from the outlet that was his goal for an hour, thinking you had won. As soon as you stopped entertaining him, he was back at the outlet again. My error was forgetting that I had 2 boxes of food coloring. So the boys had the first box and were conducting their own science experiments on the deck. When I discovered them there were puddles of water and food coloring on the deck floor, the table and spatters all over the two of them. I am sure they learned something, sigh. While I may not have the endless time I was dreaming of I still made a bay laurel ice cream. 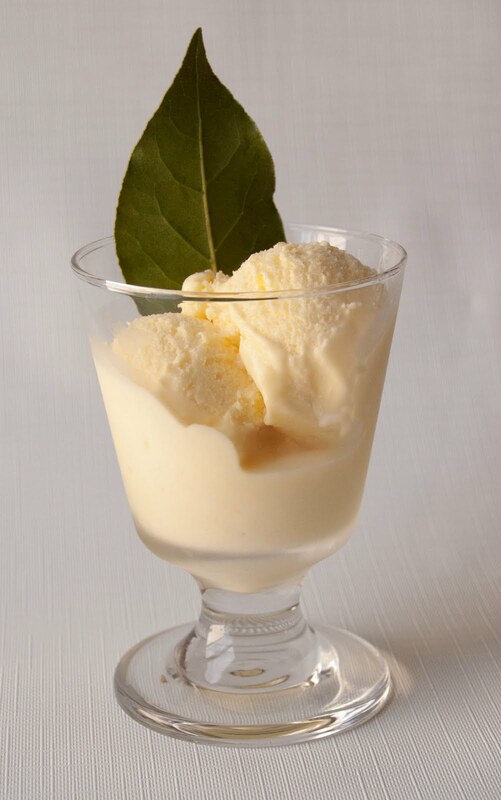 I started to dream of making bay laurel ice cream after reading Molly gush over fennel ice cream on Orangette. If the cream and butterfat soften the flavor of fennel and makes it irresistibly herbal and soft, I began to wonder if it would also work to soften the flavor and bring out the sweet under note of fresh bay laurel leaves. The end result wasn't as subtle as Molly's description, however it is creamy and rich with a sweet herbal floral flavor that nobody will guess the origins of. However that might be more because to most folks the flavor of bay laurel leaves is muddled into beef stew and not because it is disguised. This ice cream tastes nothing like stew, instead it has a sweet flavor that lingers in the mouth as the ice cream melts on your tongue. Let me be clear that this should not be made with the dried bay laurel leaves you have gathering dust in your cupboard. I am lucky enough to have a bay laurel tree, if you aren't you can substitute another favorite herb, or buy a bay laurel plant. If you live locally, Red Wagon Plants is carrying them this year and should have them at the local stores that carry their plants. Check out my post on the Red Wagon Plants blog that explains how I care for a bay laurel tree in Vermont. Maybe working on that post explains why I had bay laurel on the brain and made this ice cream. Whatever the cause this is a dish i will be making again. 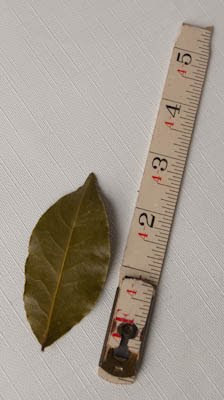 (Sometimes you can also find fresh bay laurel leaves in the produce section of your grocery store). Combine the heavy cream and bay laurel leaf and a small heavy saucepan. Bring the cream to a simmer, remove the mixture from the heat and let steep covered for 30 minutes. After steeping the bay laurel leaf in the cream for 30 minutes prepare an ice bath. Place the milk, 1/2 cup of the sugar and the salt in a medium sauce pan. Bring to a simmer while stirring to dissolve the sugar. Prepare an ice bath and whisk the egg yolks with 1/4 cup sugar in a medium metal bowl and set aside. Combine the milk, ½ cup sugar, and a pinch of salt in a medium heavy saucepan, and bring just to a simmer, stirring to dissolve the sugar. Add the hot milk to the egg yolks in a slow stream while whisking. Warming the eggs gently this way prevents them from scrambling. Add the egg yolk/milk mixture back to the pan. Cook the mixture over medium low heat while stirring constantly with a heat proof spatula (I use silicone). Make sure to scrape the bottom and sides of the pan as you cook it. When the mixture coats the back of the spatula and thickens pour it through a fine mesh strainer into a metal bowl set in the ice bath. Stir until cool, when it is cool strain the bay laurel flavored cream into the egg yolk mixture. Continue to cool over the ice bath until very cold or just cool it in the fridge for several hours. The mixture must be totally cold before proceeding. 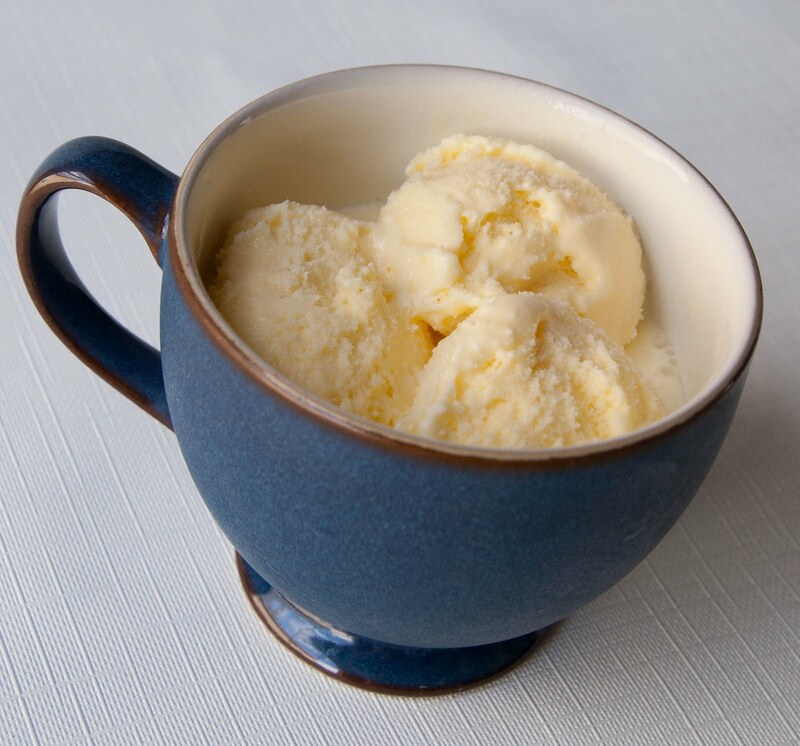 Freeze in your ice cream maker and then place in the freezer to harden before serving. Oh my goodness, Robin. Beautiful. And I'm so glad the boys had a great week of camp ... and food coloring.